Some days they are really snappin. Wind, clouds, low pressure ,I don't know I'm not a fish. At the end of the day I asked my customers Patrick and David how many fish not counting rock bass we caught they guessed 75, I wasn't counting but it was well north of 50. Started out fishing rock and wood humps 6-10 lot of bass but only kept two walleyes. 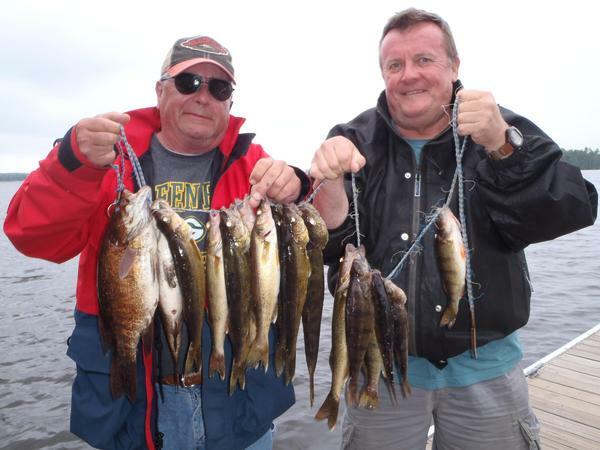 Most of our walleyes were caught in 14-15'. Make sure to take large leeches, not the extra large, (the size of small snakes, but good sized) we did best on walleyes today on the leeches. We caught a lot of bass today we elected to keep two 15-16" fish, released a lot of nice fish . I had two half day trips booked with solo fisherman, I called them both to see if they wanted to fish a whole day together , it worked out great, we had a lot of fun.